Jang Tae-san is a small-time gangster who has learned to survive with his fist and wits. He meets and falls in love with a college student, Seo In-hye, who sees a good heart and wounded soul underneath his tough exterior. When In-hye gets pregnant, Tae-san prepares to leave the gangster organization to start a life with her. But he is blackmailed by the gang boss, Moon Il-seok, who wants Tae-san to be his fall guy for an assault charge and go to prison in his place; Il-seok threatens to kill In-hye if Tae-san refuses. So Tae-san tells In-hye to get an abortion and cruelly breaks up with her, then goes off to prison for several years. Lee Joon-gi delivered one of his best performance to date in this drama. I still remembered him as a feminine man in the movie - King and the clown. Time passes by so fast, this man had grown up to be a handsome and matured man. His delicate facial features are still there but he is no longer just a pretty boy anymore. 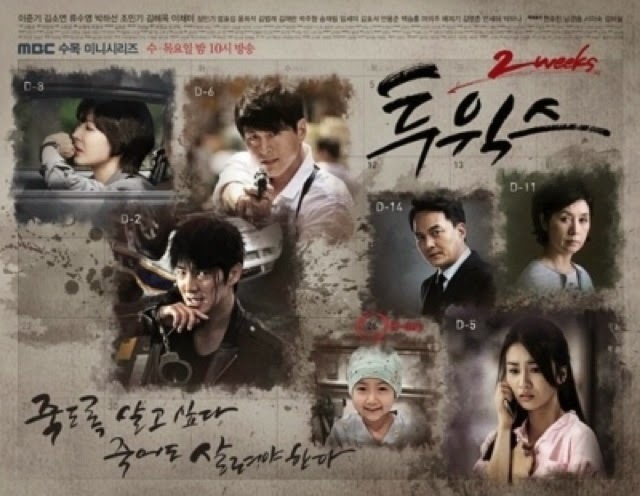 In this drama, Lee Joon-gi is convincing as a man who struggled to live. All the professional methods that he used to escape were interesting and unthinkable. From a crowardly small-time gangster to a brave and loving father, the transition was smooth and touching. He impressed me with his acting skills in every episode. Gradually, my only motivation to finish watching this drama is mainly because of him rather than the storyline. In my opinion, there are only a handful of actors that were able to cry convincingly well without looking ugly. Lee Joon-gi belongs to this category of actors. There were many emotional scenes where he challenged himself to do well each time. The best part of the show was his interaction with his adorable daughter who was terminally ill. Those emotions that was presented onscreen were so raw and real. I would like to specially mention Lee Chae-min who acted as his daughter that suffers from leukemia. She is so cute and innocent here. The romance on the other hand were downplayed. Park Ha-Sun does not have great chemistry with Lee Joon-gi. Neither does she have any chemistry with Ryu Soo-young. As an actor, Ryu Soo-young did not leave much of an impression other than being a good guy. I do not like Kim So-Yeon performance in this drama. She does not have poor acting skills, it is just that there is something wrong with her character. She seem to be trying too hard to protray a Procecutor that was tormented by her own past and experiences. Most of the time, she was frustrated throughout the drama, especially when she failed in her mission. While it is understandable that she wanted revenge, she did not show her intelligence in many situations. Her only motivation is to nail the criminals behind her father's murder and she has been trying so hard all these years. As a Procecutor, she is not calm and rational enough to lead a team of detectives to catch the criminals. As a result, she tends to make bad decision and judgement. The villains were predictable and nothing smart came out from the script. The action scenes and all the scheming behind every move build up to nothing fantastic. Yes, certain parts were draggy and falls flat whenever they tried to built some suspense. As usual, the rich and the powerful politician who were greedy and manipulative, eventually falls into our hero Jang Tae-San trap. The cast were moderately good, however the storyline seem to be a little letdown to me. Half way through the cat and mouse chasing game, I have already lost half of my interest in the show. The suspense and thrill were not that engaging afterall. I shall not mention any spoilers, just in case you have not watch this drama. In conclusion, Two weeks is a heartwarming action thriller that is worth to watch. Especially if you are a fan of Lee Joon-gi. Just be prepared for some impractical plots and some noticeable flaws in the drama. Most of the time, Lee Joon-gi is on the run from the police and the assassin that was sent to take his life. If you are willing to overlook some of these loopholes in the storyline, then you would enjoy this drama.